I participated in my first social media chat recently and was unimpressed. The moderator asked a series of questions via Twitter with a certain hashtag, and participants can answer the questions that the moderators pose over an hour time span. #SociallyGoldChat is a conversation on Twitter where users get together to talk about all things social media. 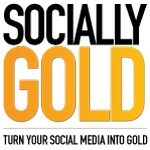 SociallyGold chat is where you have a conversation on Twitter and follow along using the hashtag #sociallygoldchat. If you use an application like HootSuite, you can create a column and keep up that way. Ex. Q1: What was your favorite social media campaign in 2012 and why? – A participant would respond with “A1 The election #x” or “A1 the Olympics #x” #x in this example is the same of their specific hashtag to moderate the chat. I write this post because I think I can do a much better job. I would like to host a social media chat in which participants can actually learn something. Anyone can participate, whether you are looking to offer advice, gain knowledge or simplu meet other like minded social media ninjas, this chat is for you. The initial chat will be on Wednesday, January 9th, 2013 at 9pm EDT/6pm EDT. You’ll learn how to better your social media. To participate, respond to Question 1 (Q1) with Answer 1 (A1) and Question 2 (Q2) with Answer 2 (A2) etc. Let us know in the comments if you will be joining us. If you also have questions you would like to ask social media managers, let us know in the comments and I’ll add it to the list.